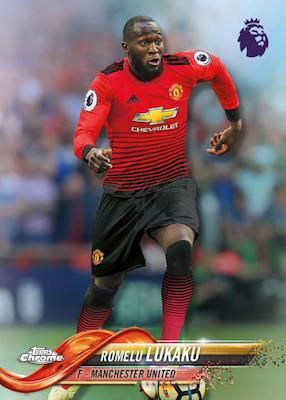 Applying the chromium finish to players from arguably the biggest league in the world, 2018-19 Topps Chrome Premier League Soccer is the first chance for collectors to own Chrome EPL greatness. Exclusive to hobby stores, every box contains one autograph. 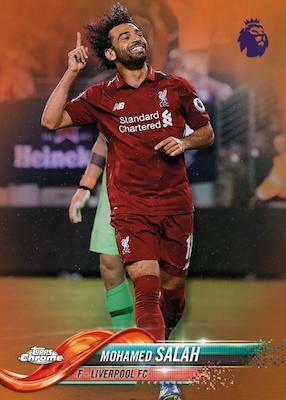 Showcasing 100 notable players, the base set in 2018-19 Topps Chrome Premier League Soccer features the 2018 MLB design. In addition, the Refractor rainbow offers several base Refractor (1:3 packs) cards per box, plus limited Purple (#/250), Blue (#/150), Green (#/99), Blue Wave (#/75), Gold (#/50), Orange (#/25), Red (#/10), Red Wave (#/10), and SuperFractor (1/1) editions. There are also Base Image Variations with one-of-one SuperFractors. 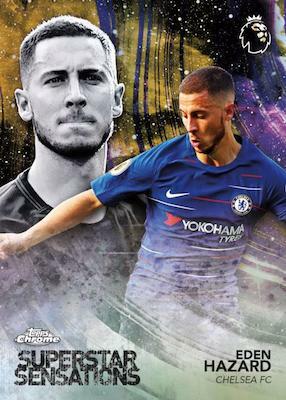 The '18-19 Topps EPL Chrome inserts use several designs to honor some of the best players across the Premier League. 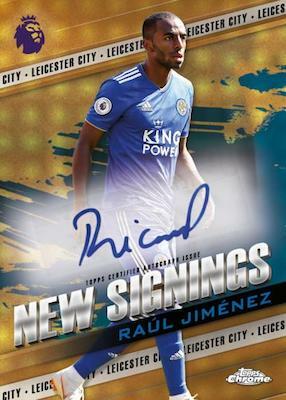 New Signings identifies those wearing new club kits for 2018-19, Premier League Debut (2 per case) looks back at the initial PL appearance for notable stars, and Superstar Sensations highlights the true standouts of the league. All three sets have Gold (#/50), Orange (#/25), Red (#/10), and SuperFractor (1/1) parallels, as well. Taking the main design for a spin, many collectors will have their eyes on the Base Chrome Autographs. The 2018-19 Topps Chrome Premier League checklist provides an autographed rainbow Refractor chase, too, with Blue (#/150), Green (#/99), Blue Wave (#/75), Gold (#/50), Orange (#/25), Red (#/10), Red Wave (#/10), and SuperFractor (1/1) parallels. More signatures come via the insert sets, including New Signings Autographs, Premier League Debut Autographs and Superstar Sensations Autographs. The base versions for these cards are numbered and there are one-of-one SuperFractor cards. Buy 2018-19 Chrome Premier League boxes from Topps for $64.99. REFRACTOR PARALLELS: Base Refractor (1:3 packs), Purple #/250, Blue #/150, Green #/99, Blue Wave #/75, Gold #/50, Orange #/25, Red #/10, Red Wave #/10, SuperFractor 1/1. 5 cards. CMP code ends in #908. 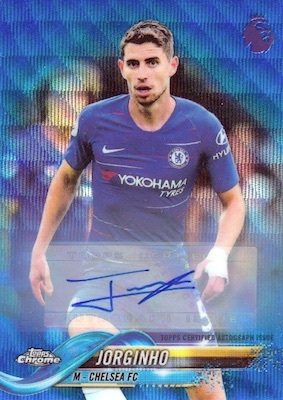 Buy 2018-19 Topps Chrome EPL autographs on eBay. REFRACTOR PARALLELS: Blue #/150, Green #/99, Blue Wave #/75, Gold #/50, Orange #/25, Red #/10, Red Wave #/10, SuperFractor 1/1. REFRACTOR PARALLELS: Gold #/50, Orange #/25, Red #/10, SuperFractor 1/1. 10 cards. 2 per case. 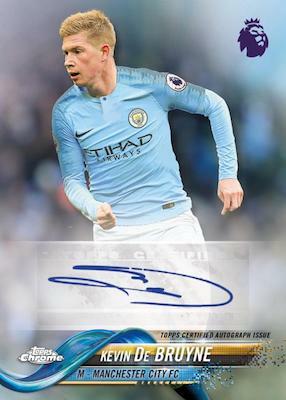 View the 2018-19 Topps Chrome Premier League checklist spreadsheet. That checklist is horrid and so incredibly lazy. LFC alone… no VVD, no Alisson, no Keita. Terrible lack of effort putting it together. Great auto list, nice looking parallels, debut inserts are tough to come come by. Photo variations are a sneaky hard case hit. 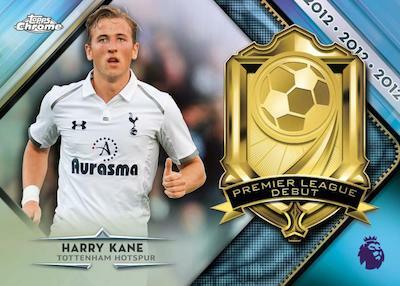 Very well done by Topps for the first PL Chrome product. Been hearing that there are too many redemptions though! 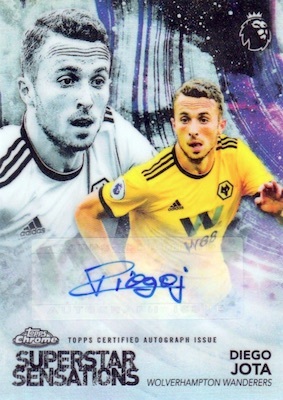 Auto checklist is meh, though probably a little better than past Topps PL releases–but good soccer photography and parallels galore make this release. You’re unlikely to pull a ton of value from a box, but if you want beautiful and colorful cards featuring your Saturday morning heroes, this release is it. It feels like Topps should have started using their own brands right away rather than trotting us through the significantly less fun Gold and Platinum. I hope next season’s license holders, Panini, take notice that they don’t have to reinvent their products for footy’s sake.